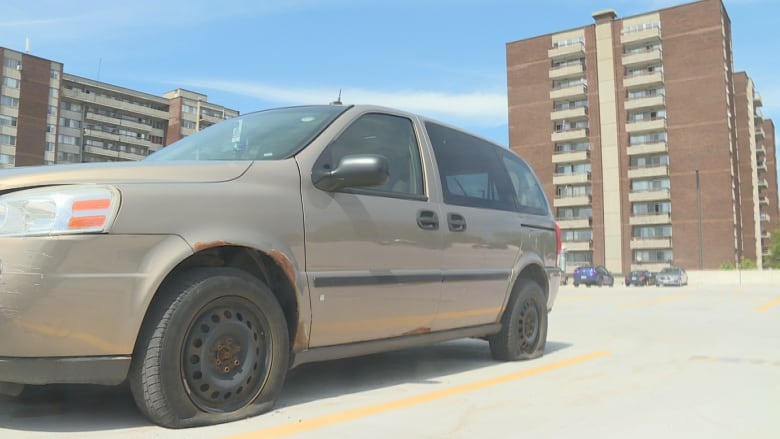 Roughly 25 residents of an apartment complex on Halifax Drive near Walkley Road awoke to find their tires slashed on Saturday morning in a seemingly random wave of vandalism. Residents of an apartment complex on Halifax Drive near Walkley Road awoke to a seemingly random wave of vandalism on Saturday morning. Roughly 25 to 30 residents found their tires slashed in the outdoor parking lot of the apartment on 2240 Halifax Dr.
Ali Arif noticed two of his tires were flat when he was on his way to work early on Saturday. "I came down. I looked at my car. It was flat. I got so upset, 'Why is this happening? Who doesn't like me?'" he said. "I thought it was only me, but then I looked around and it was every car." Arif immediately called his work to tell him he wouldn't be coming in, before calling building security then the police. When he called the police, they told him five to six people had already called to file a report. The parking lot — which is owned and operated by Urbandale — does not have any security cameras monitoring the outdoor parking lot. But there is an underground lot that does have cameras, Arif said. "I am going to tell them I want parking downstairs," he said. The person responsible appeared to have targeted only one side of each vehicle and avoided vehicles closer to the building, Arif said. Melanie Crater discovered two of her tires had been slashed about an hour after Arif. "It's awful. It's heartbreaking. We don't make a lot of money and tires are expensive," Crater said. With the tow, Crater said the total cost for replacing the tires was roughly $400. Arif said he waited four or five hours before a tow truck came and paid nearly $500 for his repairs. Both Crater and Arif said they will be asking Urbandale what they intend to do about the damage. Their office is closed for the long weekend, so Crater said she would be calling on Tuesday to see if she can get reimbursed and to ask about getting more security. "What I'd like to see are cameras," Crater said. "We do have security, but security doesn't come around that often and we pay $50 a parking spot." Arif said he will be also be asking about the possibility of getting reimbursed, but he is more concerned about safety. "It's not only about cars, or damaging property, it's about personal [safety] too."